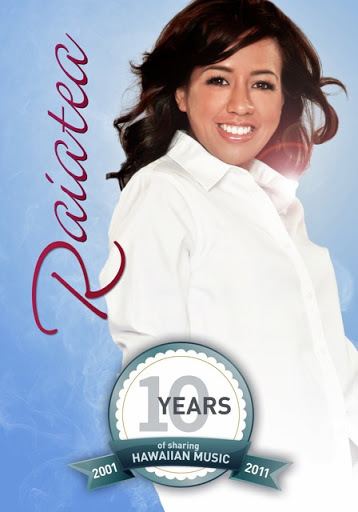 Throughout decades she spent producing culinary series for PBS, and today as co-founder of the foodie-gathering website Share Your Table, the top question everyone asks Melanie Kosaka is where do Hawai’i’s chefs eat? 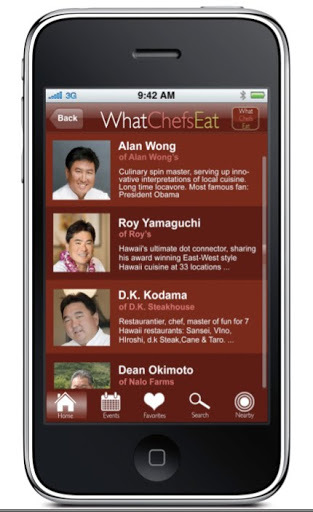 After talking with good friend and Hawai’i’s master sommelier Chuck Furuya, and connecting with ICanHasCheezburger.com founder Eric Nakagawa, Kosaka has answered the call by creating the What Chefs Eat iPhone app. 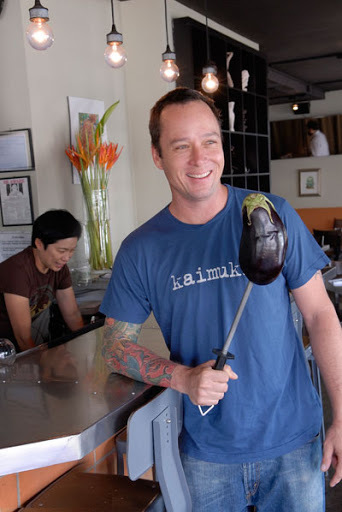 “We don’t need to know the 50 pizza places close to us, we want to know the top three, recommended by people we know,” says Kosaka, who asked just a dozen of Hawai’i’s elite chefs and farmers, from Alan Wong to D.K. Kodama, what they like to eat at their favorite hole in the wall spots and why. All users have to do is choose a chef or category, like best late night spot, and up pops their photo and brief, geo-targeted recommendations, with directions on how to find, say, Roy Yamaguchi’s favorite fried chicken at Zippy’s Kahala or Ed Kenney’s top noodle haunt Super Pho. Kosaka’s rolling out fresh San Francisco, New York and LA versions soon, as well as new categories like food and wine events and best places for barbeque. They’re also working on releasing a version for other platforms, but for now this seems the tastiest excuse to buy an iPhone. When I reached Ms. Kosaka she told me: “We have not (yet) launched the West Coast version, but … on Sept. 30 we are launching one of the first locavore on-demand tv channels in the U.S. The channel is the video complement to http://www.shareyourtable.com/.&#8221; Can’t wait to see it! 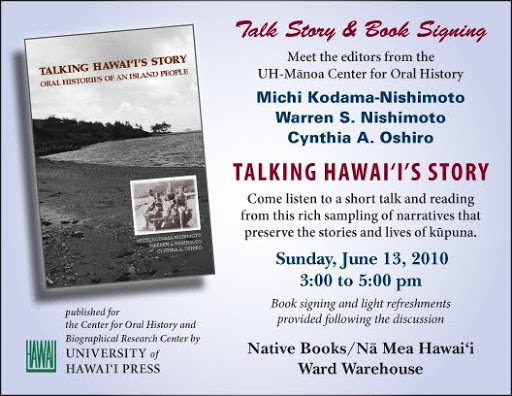 This Sunday, June 13, I recommend visiting Na Mea Hawai’i: Native Books to hear a talk and readings from the 2010 Ka Palapala Po’okela Award-winning book Talking Hawaii’s Story. I found the thirty narratives included in this book to reveal diverse experiences, values, and feelings of men and women born between 1900-1930, in turn illuminating not only their lives, but their parents’ and grandparents’ and, through that lens, prominent events in territorial and state history. Read more of my November 2009 review here. 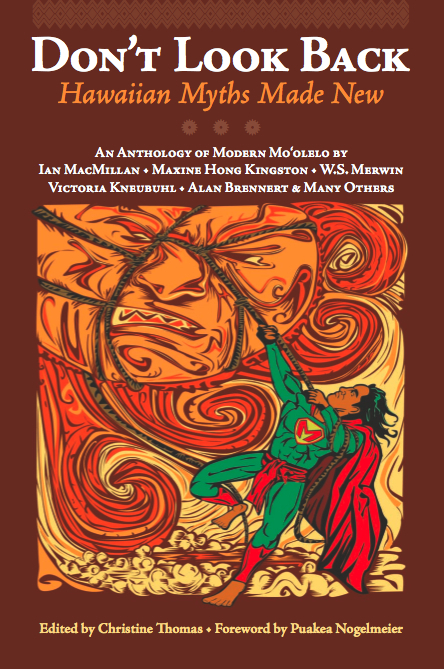 When I first read Lauren Leto’s deliciously evil list stereotyping readers by their favorite authors, I thought “someone should do this for Hawai’i.” Then, in a Twitter post, the lively and lovely Dawn from Honolulu’s Watermark Publishing nominated me to do just that, knowing nothing of my own thoughts. Duly encouraged, here I am a few months later with a list of my own. Here they are in no particular order. Feel free to add to the list in the comments and forward the link. It’s all in good fun. “I am, as usual, doing too many and too few things at once,” says artist Gaye Chan when asked what she’s currently working on. 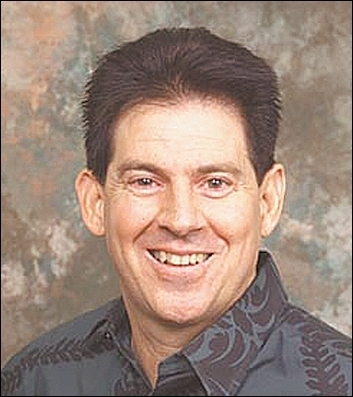 Chair of the University of Hawai’i’s Department of Art & Art History, art director for poetry publisher Tinfish Press, and the brain behind a “HI-5 anarchist recycling bin project,” Chan focuses not on what art is but what it is used for. “I’ve been looking at portraiture for a long time—who gets pictured, who wants to be pictured, how they want to be pictured,” says Chan. Her current work-in-progress, Frass, scheduled to open at the Honolulu Academy of Arts this year, incorporates 200 miles of aerial photographs around the U.S./Mexico border. But Chan isn’t concerned with maintaining a signature style, and her work—placed for free in the community and viewable at locations like the University, Hawai’i State Art Museum, and Four Seasons Maui—is driven by what she finds interesting. 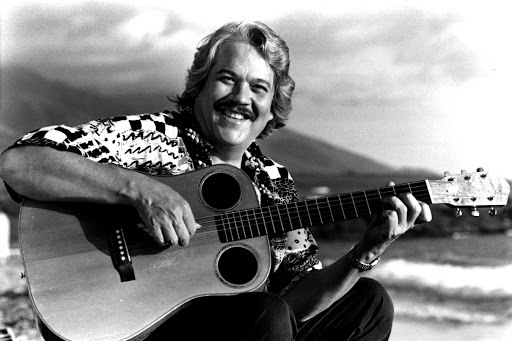 –Also check out Chan’s dynamic book Waikiki: A History of Forgetting and Remembering, and my review here.